Sorry for the lack of creative inspiration this past week - I have been off having a good time with my family. After the essentials are done each day I have been enjoying the companionship of my family. My mom, sister and hubby are here from Calgary, Canada and we have been off enjoying the beauty of this incredibly gorgeous region, as well as celebrating my baby's 13th birthday. I thought I would share just a few shots from our visit to Northwest Trek (we've lived here for 20 years and this was the first time there). Let me tell you - it was SO worth the hour drive!!! 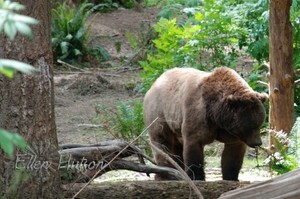 All the animals at Northwest Trek are native to this area, but we rarely get to spot one in the wild. Therefore this was a wonderful opportunity to get up close and personal with so many of them. 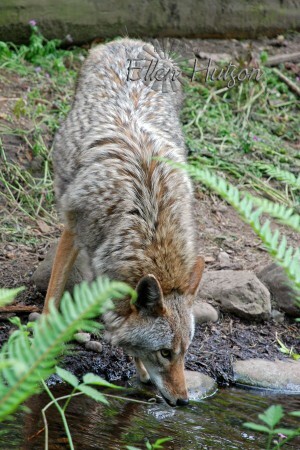 I was so close to this coyote that I could see his little tongue lapping up the water! The way they have designed the facilities allows you a wonderful view of the animals in their natural habitats. There is no glass between you and the animals, yet you are safe from these monstrous predators. I can only imagine how BIG this guy would have felt had he been any closer! 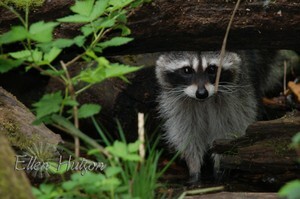 I'm not certain what it is about a raccon's face, but this little cutie was adorable. The flowers are in full force as well. The exquisite beauty of nature right in my own back yard is in full display!!! These gorgeous poppies are pure inspiration - I wish I had those amazing Stampendous poppies to replicate these incredible colors. The velvety texture inside these beauties just makes you want to reach out and stroke them. I tried to wait for that silly little bee to poke his head out before snapping this picture, but he just wouldn't cooperate. The minute he poked out, he flew away. 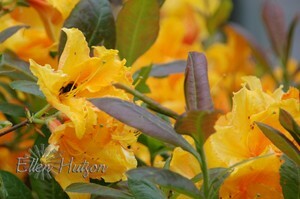 Oh well... so much for the desire to capture that moment, but I hope that you can enjoy the stunning colors of these scrumptious rhododendrons. Rhody's as we call them here in the NW come in a huge variety of colors ranging from pinks, reds, purples, whites, apricot and oranges. I'm guessing I have missed some as well, but they are glowing right now all over the Puget Sound area. I just wanted to pop in and quickly let you all know that the Splitcoaststampers Weekly Inkling is being sent out today. I received mine in my inbox this morning - so check your inbox and see if you have received it yet! If you are not signed up I think you should - LOL! There is nothing like getting eye-candy in your inbox. You will see my first ever little Sponsor Ad in the Weekly Inkling as well. Be certain to enter SCS10 in the Promo Code box and you will receive a 10% discount on your ENTIRE order! This code will be valid today through Friday, May 25th - so place your orders now before I run out of inventory! What a hilarious process it was in developing the little "logo" of sorts for this endeavour. I had all of about an hour in which to come up with something. So what do you think? Should I keep it or come up with something better? Does it even look like something I would create? I'm so excited to at last be sharing this fun technique, Parchment Craft, in a tutorial with you. My goal is to continue with the educational process, sharing more information regarding this elegant and beautiful technique in the future. There are SO MANY more techniques, borders, effects that I still have to share, but I wanted to start out in a simple manner in hopes of making it easy enough for anyone to try. I LOVE the versatility of this special little heart! Some interesting concepts I would like to share with you that could add a whole new dimension to this creation is to think in terms of the occasion that you are celebrating. Think of how awesome this little heart would look with a Monogram in the center - what a wonderful personal touch that would make on a wedding card. Or if you are celebrating an anniversary you could place a number in the center. Now on to just a little information as to the history of parchment craft. I am fascinated by the strangest of details and so I hope I don't bore you with just a little of what I have learned about this gorgeous technique. The history of Parchment craft dates back to the 14th century - this is back to the early days of written text. It began in abbeys and monestaries in countries such as Germany, Spain and Holland and was made by nuns and monks making communion cards and devotional pictures. The Spanish influenced this craft and brought it to the Americas, particularly South America. According to my reading Parchment craft is still taught in many South American schools, with various different forms evolving over the past 500 years. I would be fascinated to learn whether or not this is true - if you have details I would love to hear from you. At first real parchment was used for the nuns and monks work, and later a parchment paper was developed in Western Turkey as a substitute for papyrus. 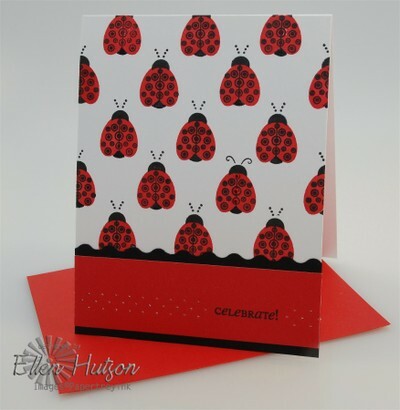 All cards were made by hand until the arrival of the printing press in the 15th century. Biblical themes were the most prominent, continuing through the 18th century. At this time cards started becoming larger and decorative borders were added, these were once again done by hand. During the 19th century a change occurred when the craft became strong in Paris. The themes became more romantic and personal. It was at this time that embossing to create a raised effect was added to the craft. By this time most of the borders, perforations, and cuts were done once again by machine. The return of Parchment Craft is attributed largely to Martha Ospina. Born in Columbia, South America she learned the craft at a young age. She later married a Dutchman and moved to Holland. The popularity of the craft grew and as the popularity of the craft grew and materials were not available in the Netherlands they decided to develop and produce the tools and products themselves. It was in 1988 that they founded and introduced the world famous Pergamano product line. There are tutors in 25 countries worldwide who have studied this art form to the highest levels. I can only imagine dream of having the abilities that they do, but I muddle through and study when I get a minute and then turn it into an adaptation of this art form that I find pleasing. I hope that you too can enjoy the soft elegance of this beautiful art form. It's a "RECIPE CARD CONTEST!" What a fun way to mix up some creative fun!!! Get out your Lockhart Company stamps and prepare a feast for our eyes!!! creativity and see if you are a winner!" 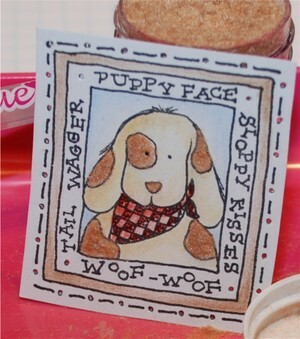 For more details you can find specifics at Lockhart Stamp Company. 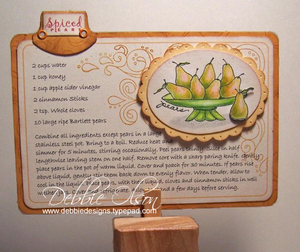 The incredibly talented Debbie Olson has put together this absolutely stunning example for you to use as a jump-off point; something to get you excited and stimulate your creativity. Debbie's talents never cease to amaze me!!! No worries - Debbie is not allowed to enter this contest - LOL! So figure out what recipe you would like to dazzle us with and get creative ladies - the prize package is absolutely DELECTABLE! Thank you so much for sharing your creations with us out here in cyberville Debbie! Viewing your beautiful pieces of artwork makes be get goosebumps. Guess what recipe I am conjuring up using this fun little image! 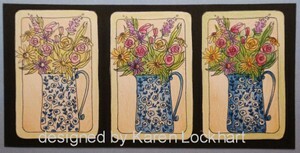 Remember that it is the decorating of the front of the card that is the most important! I do know that Karen is not going to prepare a test kitchen to prepare all these goodies :D Although I wish she would and then invite me to be a taste tester - teehee! OK - it's almost midnight and now I'm really hungry - LOL! I think I'd better get to bed before I give in and find something to snack on. Many have asked for it and it is finally coming! If you are not signed up to receive the Splitcoaststampers Newsletter Weekly Inkling I would love to encourage you to sign up now. In fact you will definitely want to check out this newsletter to get the promo code for shopping at my webstore on Thursday and Friday of this week! The tutorial coming out THIS Wednesday will be on Parchment Craft. Some of you may know it as Pergamano, but being that I am not a certified Pergamano instructor and I do things differently I prefer to refer to what it is that I do as parchment craft. I sincerely hope that you find it interesting and will learn something new. Below is just a little snippet of the project to get you excited about what is coming. I am thrilled to finally be sharing how to use some of these tools. I will be sharing the basics of embossing and perforating, so stay tuned! p 14 - Cowgirl Party - this little ensemble includes a horseshoe invitation, a CD case holder, and a paper cowgirl boot favor bag and features the Lockhart Boots and Crate Paper. The templates for all of these projects are located at the back of the magazine on p 160. Being that I have provided these to PaperCrafts I will not be able to send these files out, so grab the magazine while you can - these little templates are so much fun! 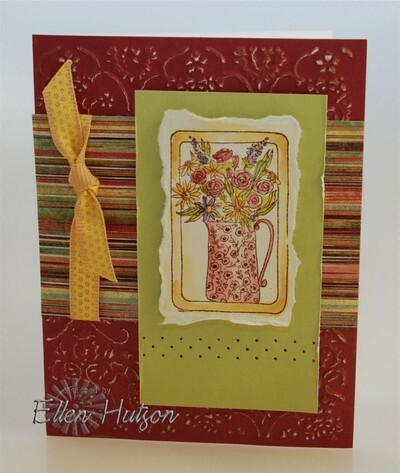 p 42 - Tea Time Party - this next ensemble features the Lockhart Teapot and scrumptious Heidi Grace papers. This may in fact be my favorite project that I submitted being that the colors are so refreshing and spring like. The invitation is contained in a little gift bag which also includes a little favor for the recipient. 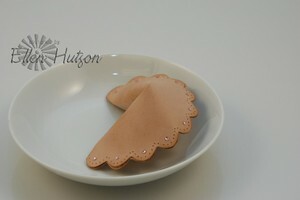 p 95 - Takeout Gift Box and Card - this little fortune cookie card puts a new twist on card designs. You CAN make a difference by emailing Karen Foster at support@karenfosterdesign.com and letting them know how much you love the Snap stamps. Below is the email many are receiving in return - so let them know what you like about the stamps and what fonts you would like to see. Even make up some new ones if you'd like. Keep those emails flooding their inbox if you would like to see the Snap stamp manufacturing continue!!! What size of stamps and font would you like the most? We are going to discuss this in our next company meeting. You can also leave a message on this thread with any suggestions you may have. 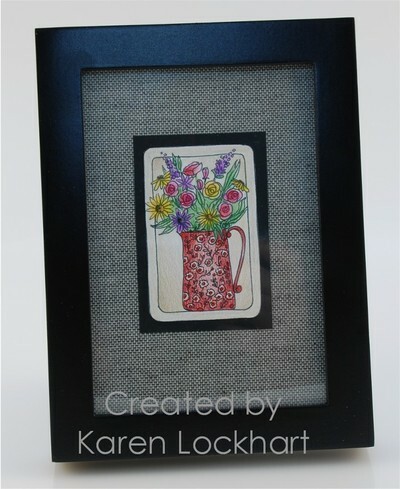 I have been in touch with Karen Foster Design and hope to talk with their product development manager soon. So let them know what you would like to see. I have suggested a lowercase formal set and an upper and lower case casual in the 1/8" and 1/4" sizes. I would LOVE to see stamps in both a sans serif and a serif type - this would give us both a masculine and feminine look. Perhaps even a Calligraphy type or a script. Funky is always good, but we need to start with the basics and add from there. Let's see if our voices can make a difference!!! I don't want to loose this amazingly flexible product that allows us to stamp any sentiment our minds can dream up! We are currently working to set up credit card processing information right on the Ellen Hutson LLC webstore site and are experiencing some technical difficulties. I am working on it and hope to have these taken care of today. I truly apologize for the inconvenience and will update this post when all difficulties are remedied. In the mean time I do believe that you can still process an order by linking through to the PayPal site where you are still allowed to use major credit cards there. Thank you for your patience! Yeah - Fun Flock is finally uploaded to the store. I apologize, being that the pics aren't the greatest - IRL these colors remind me of scrumptious looking jelly beans. The colors are so pure and intense. I hope to update the pictures soon with larger samples, but at least it's a start. 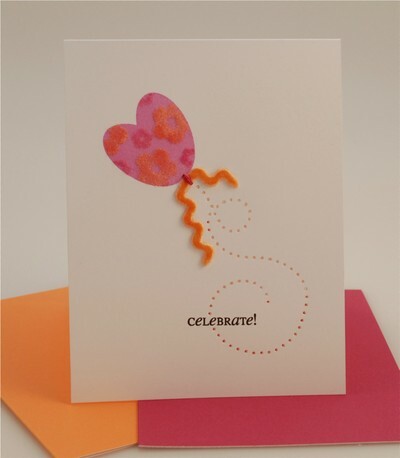 Once again I used Fun Flock to create the Birthday Balloon in this month's Paper Trey Ink Little Lady gallery. Last night I talked about all the other looks this lady could take on. I saw numerous possibilities for flowers and with the Lockhart dresses being something I adore a little dress was on my mind. I was so tickled to see both Debbie and Lisa play out this idea!! Great job ladies - great minds think a like - right - LOL! So here is my balloon version. Being that I wanted to stamp Celebrate right in the curve of the tail and I'm lazy so I didn't want to mask :D the tail was stamped first using a VERY light ink. 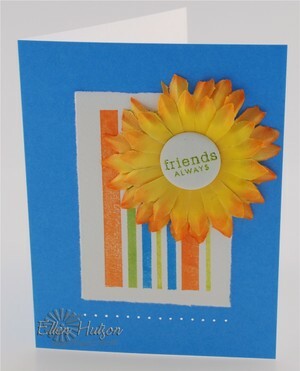 Next I stamped the "balloon" using Colorbox Petal Points Blossom Chalk ink. I like to work quickly and therefore heat set the ink so that I could move on. I stamped and created a reverse mask using Eclipse Tape. 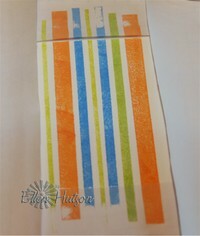 Place the mask over the balloon and then stamp the large flowers using The Essential Glue Pad. Flock with the Cantaloupe Orange (as you can see this is a GORGEOUS color - nothing like my poor little sample on my webstore site!). Press lightly with your finger and tap to remove excess flock. 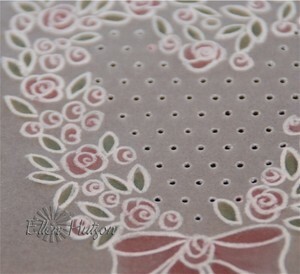 Repeat with the small flower using Pixie Pink Fun Flock. 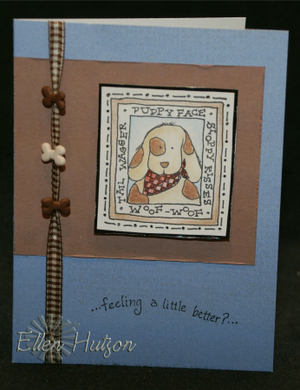 (Pixie Pink is the color I used on my Faux Velvet Ribbon card as well.) Remove the mask and you have this awesome textured balloon. 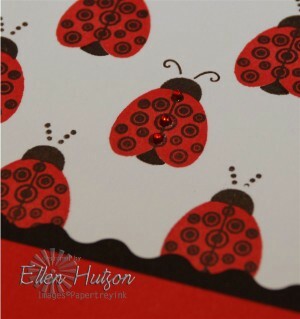 Without this awesome texture this card would have been BORING - but the amazing quality this little embellishment adds is fabulous. Nichole designs these sets with versatility in mind. Another thing you might want to note is that this trail is the perfect distance for piercing. Yes, perhaps I am the piercing queen - LOL! but again the subtle texture that it adds to this project helps make it sing. Be certain to stamp your greeting first and then skip that portion of the tail when you do your piercing. I added tails to my balloon using orange velvet ribbon from the Gypsy (Romani) set and pink DMC floss. OK - I know that I am probably going to regret this - LOL! But as always I want you my faithful customers to know that the Snap Stamps that I now have in inventory are the very last of what is available. Karen Foster has decided to discontinue them!!! GASP!!! You CAN make a difference by emailing Karen Foster at support@karenfosterdesign.com and letting them know how much you love them. I even suggested to them that they come out with additional fonts! So let them know how you feel. With that said I have double and triple checked my inventory - hoping and praying that I have the number available entered correctly. I don't want another punch fiasco and so I have kept mum about this for the last few days until I knew with 100% certainty that I had accurate information. So shop while you can here under Alphabets. What you see is what I have remaining, so if you do not see the size and item that you want they are gone - COMPLETELY gone! 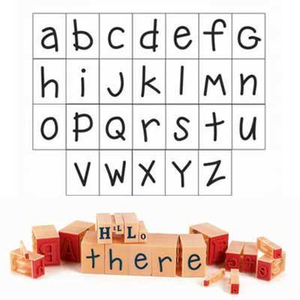 Karen Foster does not even have any inventory left of the 1/8" and 1/4" alphabets!!! how does life move SO FAST?!? 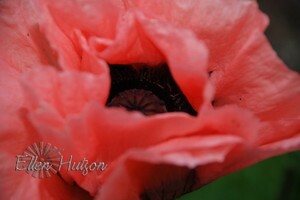 Once again my blogging has been neglected - WOW - how does that happen? Could it be too many commitments?!? Yesterday I needed to meet with an accountant to figure out all the inner workings of hiring employees. You could say that I am a bit of a novice at this stuff and so I need all the help I can get - LOL! The good news is that I think I've got it :D So, hopefully no more days spent worrying whether I am doing that aspect of this little business correctly. I am SO EXCITED to have some help with the basics - hopefully that will give me a little more time to do the part I love - that is sharing ideas right here. We have a winner - CHERYL SIMS - you are lucky number 5! I would love to have you email me your snail mail address so that I can get the little work of art that Karen created out to you in tomorrow's priority mail. Now don't hold your breath, but I am working on a color progression right now to share how it is that I color the Flowers in Chintz using Prismacolor color pencils. A huge thanks to all of you who have been so excited about this new little aspect of the webstore. I have appreciated your emails SO MUCH! So stay tuned, I hope to be back before midnight - LOL!